Abstract in German language: Die IMC FH Krems hat ihre Lernumgebungen sehr grundsätzlich umgestaltet. Sie entsprechen eher heutigen Büro-Erlebnislandschaften. Den Studierenden erwachsen erhebliche Vorteile daraus. Studying at university traditionally means: seminar rooms, rows of tables and chairs. It does not look different from school. Nevertheless, it is just the outside look of it. Contents – so what’s happening inside – is totally different: University lectures feature open, interactive formats which enable discussion, debate and lots of team work. Does debate really flow in a lined-up table-chair room set-up, which forces all eyes to the front of the seminar room but not to each other? Did you ever try to squeeze into table-chair lines in order to set in a circle for team work? It is far from ideal, sometimes even counter productive. This is the reason to let traditional lecture hall layouts fade away at IMC University of Applied Sciences Krems. Instead the university features fluid layouts of seminar rooms. In these lecture halls, students are allowed and even motivated to arrange furniture in the way they think it is ideal for their needs or for a specific course. Since university lectures are very interactive and rely on a high share of team work sessions, this kind of lecture hall flexibility is a critical success factor. Even more, IMC University of Applied Sciences Krems opened up seminar rooms and extended learning space into collaboration zones all over their buildings. These collaboration zones are open areas which are used by students from all lectures and courses and shared in this way. They offer large tables, sofas, half-closed meeting islands and many other forms of functional office furniture. Finally, university looks and feels like an innovative state-of-the-art office space. 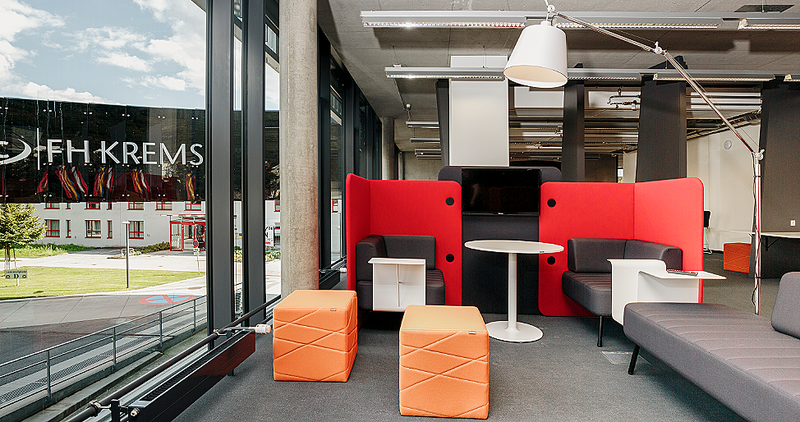 This way, students experience how to work in an modern, innovative company office. What do students experience there: How it feels to share space. How it works and does not work to collaborate in a team in an open area and how to be effective in this constellation; since team work is only sometimes about relaxed brainstorming. Most of the time team work takes place in order to achieve ‘hard’, tangible results in university courses, for example an analysis which needs to be presented, a concept design or writing a paper in a collaborative manner. Final course scorings depend on the quality of the outcomes. To that extent, it is a critical success factor to students to find physical working conditions in the university premises which enable and support teamwork. Secondly, student teams learn and will have to learn how to use this infrastructure effectively. In this way, students embrace already here an effective office work style when offered a professional state-of-the-art office environment. One more fact: The difference in effectiveness, which is achieved by this kind of flexible and open learning environment, can actually be observed. Students typically become very tired and distracted after 2 hours of lecturing in a classical classroom which features traditional layouts. Whereas energy is holding up for 7 to 8 hours in this described next generation learning environment at IMC University of Applied Sciences Krems. So, endurance of students is about 3 to 4 times higher in a fluid, flexible and open learning environment. Please share your opinion, your observations or questions and comment down here.